Many components build the Chaparral story but, in the end, it's the cars that make the real legacy. They were, and still are, the visible manifestation of the innovative power, ambitions and dreams of a rather small group of inspired people who wanted to do things different. Bright, original ideas, intensive testing programs and continuous development resulted in what some magazine called 'Midland Magic'. I'm not going to describe the cars in every detail. Many journalists have done that job already very well. Read the books (see literature), explore the internet (see links) and you'll get every data available. So, I will give you my personal and very subjective review of the different models. Let's start with the cars I've seen with my own eyes, at The Goodwood Festival of Speed in 1997. Richard Falconer proudly showed his restored 1 over there. Although equipped with an interim GRP body instead of an aluminum one, the car made quite an impression on me. I very much like the bulbous lines, the welded tubular chassis, the unsophisticated backyard special characteristics. It radiates to be a mean, powerful beast on rather skinny tires though. When they started the engine in the paddock, smoke came from everywhere! Just look at pictures of these cars during the Sebring 12 Hours in the early Sixties. The cars, fitted with extra lamps, the FIA front screens and 'cardboard' fins, look like dangerous dinosaurs from ancient times. Drivers fighting to keep it on the road, nose on the tarmac under breaking, up in the air when accelerating. There are some scale models of this type and even in 1:43 these cars look raw and aggressive. Of all the Chaparrals this is the one I would like to have in my garage! Technically it's not too complicated and it looks like it's not easy to break. I like to think it can be trimmed into a daily driver (like Reventlow did with one of his last Scarabs) and be maintained by the guys in my hometown garage. In recent years, I think all the five 1's ever produced, are restored to some extend. At one recent auction Jim Halls' original chassis 003, the shiny white beautiful beast, was for sale. Chassis #003 was sold for $1,111,000. 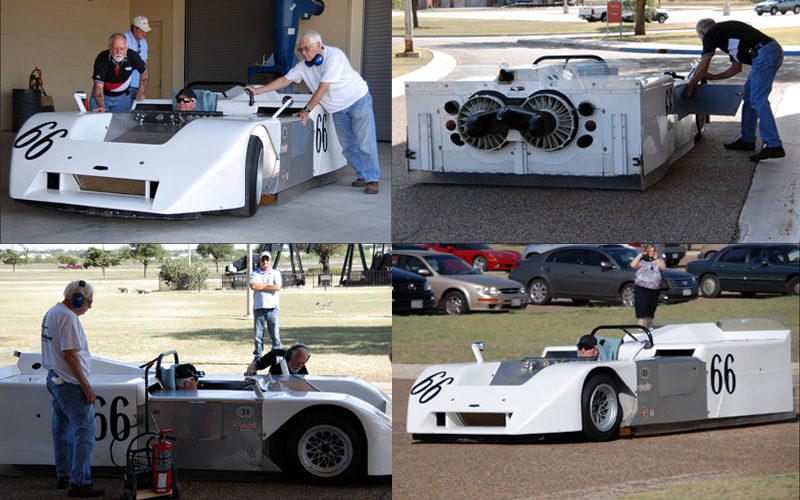 Some occasion..
Richard Falconer (center) and his restored Chaparral 1, chassis #005. Decades later to be named 2A. This car changed, outwardly, from a rather ordinary roadster into an invader from Mars! In just two and a half seasons (1963/1965)! Constantly growing tires meant development in body styles and wheels. All kinds of innovations were seen: aerodynamic front screens, louvers, flaps, tabs, lips, ducts, the 'snowplow' airdam, spoilers, even movable flippers! And that was just the visible part. Under the skin there was this incredible, innovative GRP chassis. 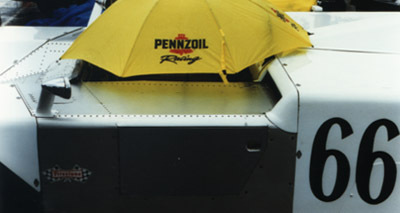 On top of that, after just a few races, the famous 'automatic' entered the racing scene, in the pits always covered by a blanket. They didn't need to do that at Goodwood, the biggest Chaparral secret is no longer a secret anymore. To me, even in 1997 the 2A looked ahead of it's time. Maybe current formula 1 and Le Mans cars with all their flaps, endplates, diffusers, winglets, vents and other aerodynamic features are finally a logical comparison. 40 years later! The 2A was the most successful Chaparral. It dominated for two seasons but lasted much longer. 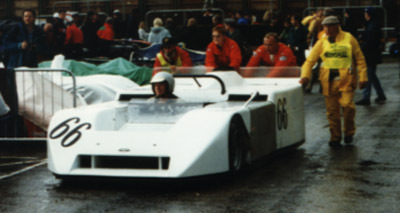 The two plastic chassis were fitted with roofs (very simply said), thus becoming the endurance coupes 2D and 2F for FIA series in Europe. 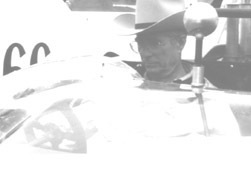 2A with Jim Hall at the wheel. With its side radiators, boxy shape and high movable wing the 2F is arguably the most archetypical Chaparral. The car must have been quite a sensation in Europe at classic racetracks like Spa, Nürburgring and Monza. Of course, Europe had seen the 2D already in '66 but the new body concept of the 2F was highly uncommon for the old world. It sadly DNFed in all but one race, due to little misfortunes like battery failures and an ill fitting spare tire at the Targa Florio. It was not a lucky season. UNTIL.. the last race, the BOAC 500 at Brands Hatch where Phil Hill and Mike Spence finally won in chassis #001. Sister car #002 was present at Goodwood. Phil Hill, 70 years of age ("I forgot how to climb out of the damn car! "), drove it up the hill once the car sprang finally into action after a lot of work by Troy Rogers. And remarkably: the 2A at the same event was actually the very chassis that in 2F form won on the same English ground. Exactly 20 years earlier, driven by Hill and Spence. The victory marked the end of a fine drivers' career. 2F with Troy Rogers at the wheel. At Sunday evening, when nearly all Goodwood visitors were gone, Troy Rogers asked for my help to push the 2F into the trailer. He didn't need to ask twice. Needless to say, I was deeply moved at that very special moment. It was a fitting finale of one of the most wonderful weekends of my life. 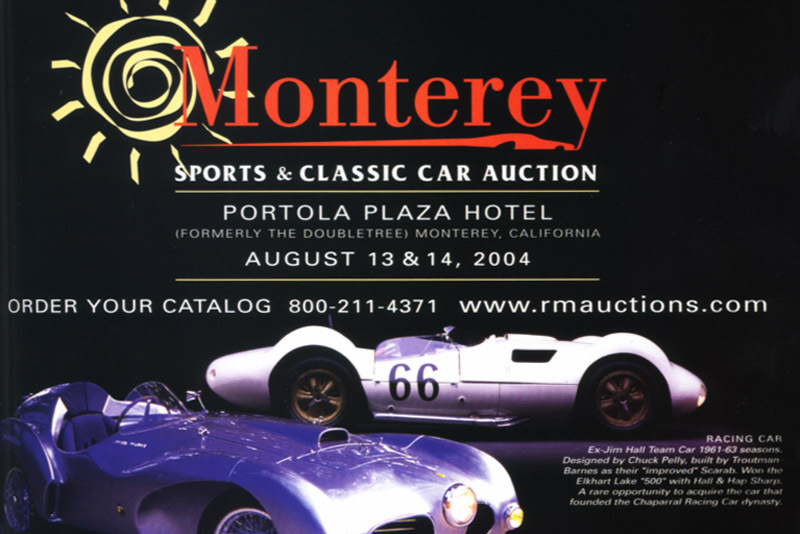 Before the Goodwood event, the only time I had seen some Chaparrals in action was on two promotional video tapes which I got from a local Penzzoil distributor. Very, very short and obscure footage from the Sixties. Until that time Chaparral had merely been a bunch of static pictures to me. The tapes changed that status already. But Goodwood was the giant leap! After more than 25 years, here was the living proof. And there it was, the car that changed my life, the 2J (see: About the Chaparral Files). A journalist who witnessed the first appearance of the car wrote something like: "the car that looks like the crate in came in." It was a rather accurate description. When parts of the body were removed I had an excellent view on the complex skirt system the overcrowded engine bay and the fans. Very impressive engineering indeed! 2J engine bay; tools from Troy Rogers; 2J skirt system. Articles of the period mention the low rumble of the big block Chevy, mixed with the high screaming sound of the auxiliary engine. Strange enough, I have no memories of the cars' sound. As with the 2F, Halls' two mechanics had to do a lot of work to get the 2J on the track. And once they succeeded Hall stayed away for a long time. When the car was finally pushed back into the paddock with engine failure and Hall climbed out he muttered: "Just like the old days." I think the vacuum cleaner was never Halls' favourite. It merely came on his path and after a lot of troubled development it still wasn't ready when it hit the track. But in the end it is one of the most bizarre, controversial, 'ahead of its time' race cars ever build. It's a true monument. On a regular basis the surviving Chaparrals are driven at The Petroleum Museum in Midland, Texas. Runs for approximately 10-20 minutes in the front circle. The running of the Chaparrals is part of the routine maintenance to keep the cars in running condition. People are invited to visit these events. Those who come early can see the cars getting prepped for the drives. Here are some pictures of the 2J Live Drive. If you're interested, contact Permian Basin Petroleum Museum, 1500 Interstate 20 West, Midland, TX 79701, 432-683-4403 or www.petroleummuseum.org. How an exotic CanAm recipe became the standard in modern race car cooking. The Egg of Columbus is a story of how to make an egg stand on end. The story is used to illustrate the notion that it takes genius to discover something new but that once it has been shown to others then anyone can do it. Take an egg.. It sounds like the beginning of a tasteful recipe. In this case a wonderful technical recipe. Because, look at an egg and what you see is a very interesting thing: it's the purest monocoque construction you can imagine. Because of his form and material an eggshell is of tremendous torsion stiffness. And additionally, it is light and strong. Qualities you would like to have in your racing car! Probably, somewhere in the early Sixties, Colin Chapman must have had a bright brainwave during breakfast when he was staring at his fresh boiled egg. In a flash he truly understood the secrets of the egg and his Lotus 25, the first racing car with a monocoque chassis, was born. Instantly his reputation of a genius was established. Only.. Mr. Lotus just delivered half work. Literally half work because his monocoque had an open upper half. It was an egg with its head chopped off and by doing that the torsion stiffness had not reached its optimum yet. The racing community had to wait for another 6 years to receive its most optimal racing egg ever. And once again, the no-rules character of the CanAm series, appeared to be the ideal nest to hatch this phenomenon. Let's go back to1968. In Midland, Texas, far away from the inhabited world, the Chaparral 2H rides numerous lonely test laps around Rattlesnake Raceway. It is a racing car like the world has never seen before. Developed under direction of driver/constructor Jim Hall. A technically super advanced concept is packed in an exotic streamlined body. But the basic recipe is simple: take an egg, bolt on a load bearing engine/gearbox unit in a longitudinal axis and attach two axles, job done. The 2H was a racing car concept the world had not seen yet. Technically and aerodynamically it was totally different. It was the first composite full monocoque chassis ever. The entire chassis doubled as the body shell. Chassis components were fabricated in Pre-preg, a brand new type of glassfiber reinforced plastic (GRP). Then the different components were bonded together to become one single structure. Then, the entire structure was cured in an oven. Within the shell a few holes were left for entry, forward vision and a few covers for adding fluids, but that was it. Apart from the paper like thin engine cover, all the rest was stressed. However, advanced as it was, the 2H had a disappointing racing career. Read all about it at The 2H Mystery (scroll down to Epilogue). Chaparral 2H, Esdo, scale 1:43. But, what do we see in Formula 1 these days? What is the recipe of a modern Grand Prix car? Take an egg, bolt on a load bearing engine/gearbox unit in a longitudinal axis and attach two axles, job done. Okay, the Pre-peg is Carbon nowadays. The then used oven is now called autoclave but it's doing the same. And modern Formula cars do have their entire chassis double as their body as well. Also in their eggshells there are just a few holes left (for entry, suspension adjustment and a few covers for adding fluids), but that's it. Apart from the paper like thin engine cover and wings, all the rest is stressed. And thus, decennia later, an exotic CanAm recipe became the standard in modern race car cooking.